I have noticed some soft spots on the underside of my baby yellow-bellied turtle. Also, the top of the shell near the tail is flexible and there is a small spot on the top left which i was able to scrape something off. I added a picture of the belly and top of the shell so you could take a look. It's normal for a hatchling's shell to be slightly pliable. I would make sure he's basking, has a UVB lamp, and is getting a good pellet (like Omega One). 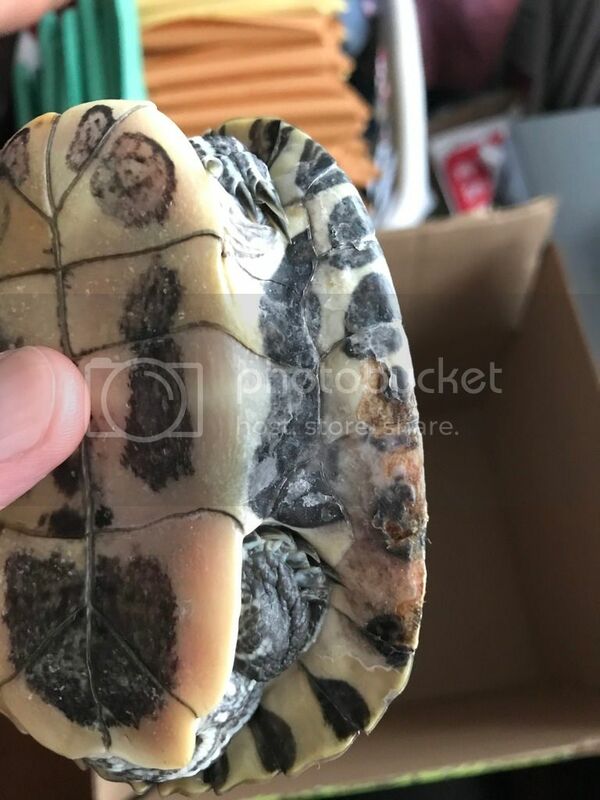 This baby's Plastron doesn't concern me as much as the Carapace does although there may be an issue on the plastron by the front legs also. That 3rd big spinal scute from his/her head definitely has an issue. As long as there is no smell and the scute isn't peeling or lifting, I would just keep a close eye on it and I would make sure this baby getting dried out and is basking regularly. I have nursed a turtle to health back from shell rot, and it isn't fun. Scooter (10") & B.C. (11") both female. Some soft spots are normal with babies but . Good eye soopermum ! I was also looking at the plastron under right arm looks like couple layers of shell off in small area (zoom in). May be from jumping and hitting something , I would keep an eye on that area for infection . Jules , This is where more time should be given to setup and make sure all is setup as correct as can be. Make sure all maintenance is done on a schedule. Proper habitat and diet goes a long way with any recovery and prevention. Observing is the key. Personally I would move the tank from the window , no way to be "consistent" on temp especially with only 2" of water and no water heater. litefoot wrote: Some soft spots are normal with babies but . The window is about a foot away from the actual tank, so no direct sunlight and i religiously check the temperature of the water etc. The setup is as correct as far as i am concerned with lighting, tank size, water level, basking area and correct filtration. I do a routine check up and scout out for any bumps or scrapes. Additionally, i watch her get in and out of the water on a daily basis to make sure she isnt struggling or falling. With all of this said, this is why i was surprised to find anything on her belly. I am working on adding in more foods for her diet. soopermum62 wrote: This baby's Plastron doesn't concern me as much as the Carapace does although there may be an issue on the plastron by the front legs also. That 3rd big spinal scute from his/her head definitely has an issue. As long as there is no smell and the scute isn't peeling or lifting, I would just keep a close eye on it and I would make sure this baby getting dried out and is basking regularly. I have nursed a turtle to health back from shell rot, and it isn't fun. There is no bad smell, luckily. She is basking regularly, and seems to enjoy it! The small spot of peeling under her right arm is what i noticed first and i have been checking on it every day, especially before i turn her lights off at night. 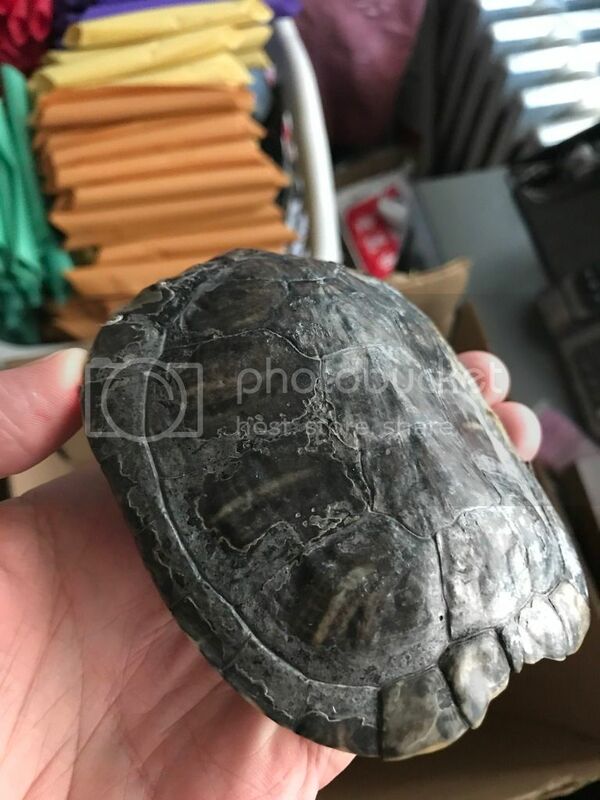 I have thought about putting some ointment on there, which i have seen some turtle owners use for minor scrapes like that. Nothing has been peeling, so far. This is why I wish a test be given for pet ownership. Turtle in life 2 months and truly believes got it down correct. litefoot wrote: This is why I wish a test be given for pet ownership. Turtle in life 2 months and truly believes got it down correct. Clearly i didnt come here to be accused of being a negligent owner. Every new owner cant be expected to get everything 110% correct. Unlike alot of new pet owners i actually do research and double check that i have the right equipment and systems in the tank. Although you believe i may be winging this, considering you felt the need to comment... i devote every waking moment to this turtle making sure i am doing everything i can and as correct as i can. You cant expect a new owner to know everything. And yes, sometimes a problem is going to occur even when you have done everything in the book, including research and asking experts. But, instead of helping and giving advice to someone who truly needs it, you decided to give your piece of negativity because i dont have 50 years of experience. Why so defensive when I explained about controlling the water temp. You stated to me "setup is as correct as far as i am concerned" , Why that statement? Red flag goes up , so the test statement after that from me. Are you willing to do what's needed or only what you want to do ? Doing homework is great but you missed or did not see one of the most important things when it comes to babies. To prevent shell problems and or respiratory infections Must have consistent water temp's 24/7 ! What happens at night when all the light should be out so turtle can sleep. Water gets cooled to room temp which is to cool for a baby ! Babies need a consistent 80 * 24/7 !!! If you leave lights on day and night ( for water temp control ) you will stress out the turtle and never sleep properly. Then a second time " setup is correct" Sorry would you rather me lie to you. This is all about the turtles health and to be happy with a full life to me . Yes very much to lean but must learn. Turtles can live 50 years if given a healthy habitat. Is the basking area abrasive? What kind of food(s) is he getting? Hi, I'm a new member and I came across this thread. Today I noticed one of my turtles had this discoloration on his shell. Does this look like shell rot? I've had these turtles for a really long time and they are always in the water, but this is the first time I've ever seen this. 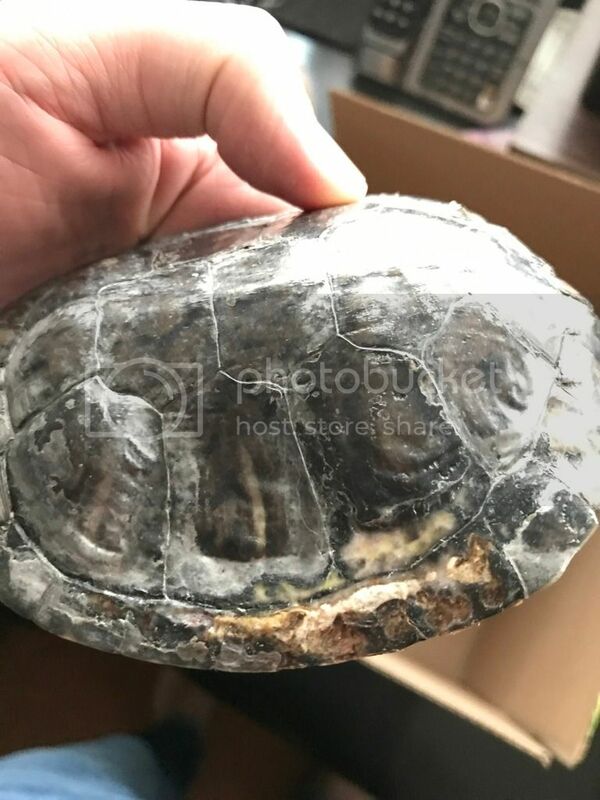 The last 2 pictures does look like some shell rot or infected scutes. Get him to a good herp vet!